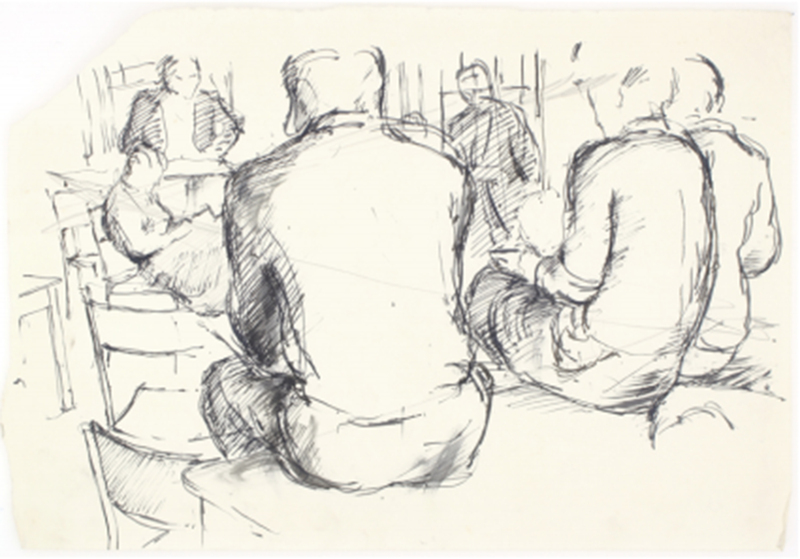 Sketch of early Beatles (AKA The Quarrymen) in a room at the Liverpool College of Art preparing to rehearse. At various moments in time (collectively or singly) Stuart, Bill Harry and Rod Murray were members of the student union committee. They were able to make recommendations for bands to be hired for the Saturday evening dances and of course unanimously recommended the “Beatles” The committee made recommendations that the union purchase sound equipment i.e. amplifiers and microphones – for use by all hired bands, especially the young Beatles. The particular advantage for the Beatles was that Liverpool Institute– a very prestigious Grammar school where Paul and George were attending, was housed in the building next to the art college and by now John was also a student at the college with Stuart.